About the event: For the past decade, Reuters photographer Finbarr O’Reilly has documented how war and conflict affect people around the world. 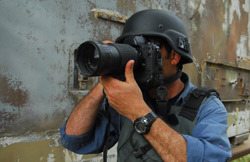 In the documentary Under Fire: Journalists in Combat -which was shortlisted for an academy award—he turns his lens around, filming himself to document the impact of war on those who tell its stories. Join us for a conversation with O’Reilly and trauma expert Bessel van der Kolk M.D., medical director at the Boston Trauma Center. On the eve of an historic election that will have a strong influence on the U.S. approach to military intervention in the near future, we will explore the emotional toll of war, how trauma affects brain and body alike, and what it takes to witness and narrate violent struggle in the world. Finbarr O’Reilly is a Reuters photographer based in Dakar, Senegal. He began his journalism career as a writer and has covered Africa for the past 10 years. He turned to photography in 2005 and received the World Press Photo of the Year Award in 2006. He has since won numerous top industry awards for his multimedia work and photography and his work has been exhibited internationally. O’Reilly has worked on long-term projects in Congo and Afghanistan and is among those profiled in the documentary film “Under Fire: Journalists in Combat,” which was shortlisted for a 2012 Academy Award. As a 2013 Nieman fellow at Harvard, O’Reilly is currently studying psychology to better understand how the human mind and behavior is affected by personal experience, with a focus on trauma and conflict zones. Bessel A. van der Kolk M.D. has been active as a clinician, researcher and teacher in the area of posttraumatic stress and related phenomena since the 1970s. His work integrates developmental, biological, psychodynamic and interpersonal aspects of the impact of trauma and its treatment. His book Psychological Trauma was the first integrative text on the subject, painting the far ranging impact of trauma on the entire person and the range of therapeutic issues which need to be addressed for recovery. Dr. van der Kolk is past President of the International Society for Traumatic Stress Studies, Professor of Psychiatry at Boston University Medical School, and Medical Director of the Trauma Center at JRI in Brookline, Massachusetts. He has taught at universities and hospitals across the United States and around the world, including Europe, Africa, Russia, Australia, Israel, and China. His latest book, co-edited with Alexander McFarlane and Lars Weisaeth, explores what we have learned in the past twenty years of the re-discovery of the role of trauma in psychiatric illness. Traumatic Stress: The Effects of Overwhelming Experience on Mind, Body, and Society was published by Guilford Press in May, 1996. About the Herbert C. Kelman Seminar Series: The 2012-2013 Herbert C. Kelman Seminar on International Conflict Analysis and Resolution series is sponsored by the Program on Negotiation, the Nieman Foundation for Journalism, the Joan Shorenstein Center on the Press, Politics, and Public Policy, The Weatherhead Center for International Affairs, and Boston area members of the Alliance for Peacebuilding. The theme for this year’s Kelman Seminar is “Negotiation, Conflict and the News Media”.